Thrill seekers, this one's for you! Ever thought of where you might find the most stunning views of Hickory Nut Gorge? 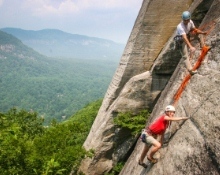 How about from the end of a rope as you climb and rappel Chimney Rock itself! Feel the rush of adrenaline as you take in panoramic views of Chimney Rock State Park from a vantage point you won't soon forget. This Saturday, March 2 from 11a.m. to 3p.m., Chimney Rock State Park partners with the Southeast's leader in rock climbing education, Fox Mountain Guides, to offer visitors a unique bird's eye view of the park from the Chimney. Beginners can try climbing Vista Rock and experienced climbers have the choice between one of two more difficult routes on the Chimney. Age and skill level are no object as Fox Mountain Guides can get you climbing comfortably within your limits in no time. Two to four climbs and rappels are available for $20 plus the park admission. All equipment is provided and no experience is necessary. Can't make it this weekend? Be sure to check out more about rock climbing clinics and weekend tasters at Chimney Rock State Park. You can also book a climb through Fox Mountain Guides anytime by calling 888-284-8433. Chimney Rock State Park is a must-see during your vacation in Western North Carolina. If you're not up for the rock climbing, the park offers a host of trails that will keep your feet firmly planted on the ground. Be sure to leave plenty of time because there is a lot to see and do! Speaking of vacationing in Western North Carolina, this is a great time of year to visit or plan your stay. 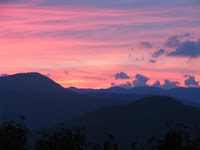 Visit Asheville Connections on Facebook, like our page, and get updates on vacation rental specials and discounts. There's a 15% off special going on now through March 28, so be sure to check it out. 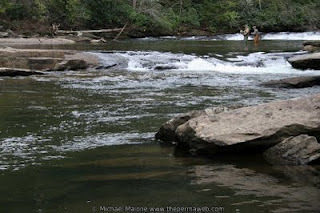 We hope you have an outdoor adventure planned in Western North Carolina soon! If so, tell us about it in our comment section. We'd love to hear from you! Asheville is known for its eclectic arts scene. This weekend in Asheville is no different with the highly anticipated performance of Flamenco Vivo Carlota Santana: La Pasión Flamenca. Filled with a stirring mix of pride, passion, love and sorrow, the performance features solos, duets, and company dances that are slated to "transcend cultural boundaries to convey universal emotions." The performance brings guests on a journey to the southern region of Spain, at the crossroads of Andalusia, the birthplace of flamenco. 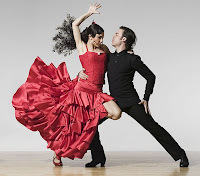 Artistic Director Carlota Santana has been hailed as "the keeper of the flame for this time-honored Spanish dance form with its vibrant influences from Africa, the Americas, and the Middle East." Guests are immersed in an evening of Spanish dance and music and come away thoroughly entertained. You can read performance reviews from The New York Times and others here. La Pasión Flamenca showtimes are at 8p.m. on Thursday, February 21 and Friday, February 22 at the Diana Wortham Theatre at Pack Place. Ticket holders are invited to enhance their theatre experience by attending a free pre-performance discussion in The Forum. The discussion is led by members of the Flamenco Vivo Carlota Santana and begins at 7p.m. Seating is limited and available on a first-come, first-served basis. Admittance to the discussion is not permitted after 7:10p.m. Regular admission prices are $35, students $30, children age 12 and under $15, and student rush day-of-the-show (with valid ID) $10. Tickets can be purchased online here. In addition to this show, be sure to check out the full lineup of other arts performances occurring this weekend at the Diana Wortham Theatre, The Orange Peel Social Club, and The North Carolina Stage Company. As always, there's a lot going on with plenty to see and do. Make the most of your time in Asheville by staying locally at a downtown vacation rental. 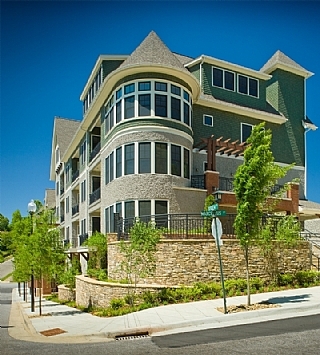 Enjoy your home-away-from-home in addition to close and convenient access to all that downtown Asheville has to offer. Make your plans now! Enjoy your weekend and drop us a line telling us what you did while you were here! Our comment section always welcomes you. Last week we talked about romantic getaways you can find in Asheville and Western North Carolina any time of the year. But with Valentine's Day upon us in a few short days, here are some of our ideas to celebrate the holiday this week. Check them out! 1. Stop by French Broad Chocolates on on South Lexington Street in Asheville. Bring your sweetie or come by yourself and pick up some sweets at French Broad Chocolates. The French Broad Chocolate Lounge is the perfect place to enjoy handcrafted artisan chocolates and pastries made with only the freshest local and organic ingredients. Find a spot on a leather couch, take in the scenery and find the perfect beverage to complement your sweet treat, whether it's a glass of Pinot Noir or a creamy stout. 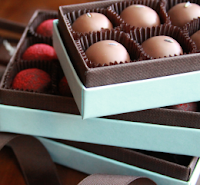 In addition to the lounge, make time for a tour of the French Broad Chocolate Factory and Tasting Room located on Buxton Avenue in downtown Asheville. This bean-to-bar chocolate factory houses imported cacao from Central and South America as well as all of the necessary tools that make their chocolates a success. Enjoy the tasting area and retail sections while nibbling on a chocolate bar or two. Tours are offered on Saturdays at 2p.m. and can be booked here. 2. Sign-up for the Valentine's Day Couples Fly Casting Clinic on the French Broad River. Are you looking to spend some time in the great outdoors? Want to do something different with your special someone this year for Valentine's Day? Try out the fly casting clinic held on Saturday, February 16 under the guidance of a Headwaters Outfitters fly-fishing guide. Couples learn to roll cast, overhead cast, and bow-and-arrow cast on the banks of the French Broad River. This two-hour casting clinic costs $60 per couple and includes rods, reels, waders and boots. Reservations are required and can be made by calling 828-877-3106 or by clicking here. 3. 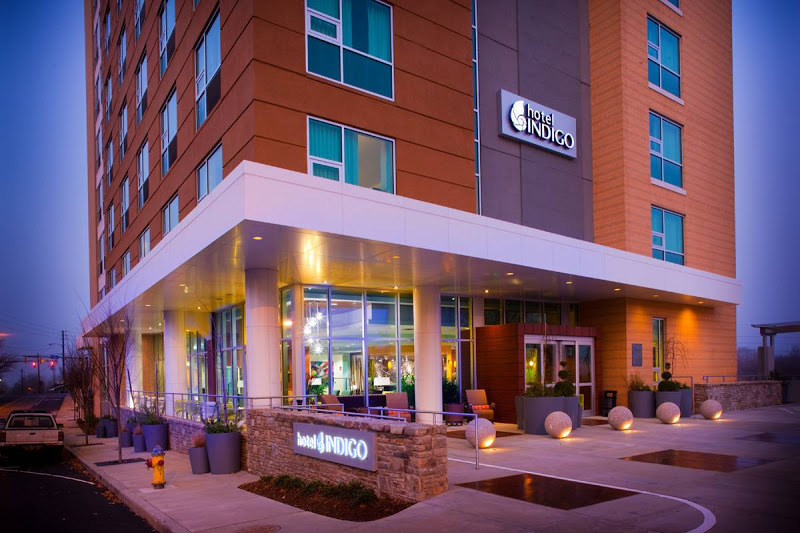 Enjoy a Single's Soiree at the Hotel Indigo in downtown Asheville. Valentine's Day is not just for couples. Take advantage of the opportunity to meet and mingle with some new friends at the Single's Soiree. The night is filled with fabulous food, live music and great company. 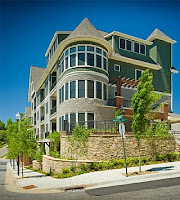 The soiree is held on Thursday, February 14 at the Hotel Indigo on Haywood Street in Asheville. Festivities run from 5-10:30p.m. with live music by Flamenco guitarist Juan Buenavitas beginning at 7p.m. The Valentine's Day featured menu includes scrumptious selections, featured wine pairings and a full bar. The menu includes roasted tomato bisque, pistachio-crusted halibut, citrus beurre blanc, steamed jasmine rice, sauteed asparagus, filet aux poivre, mushroom Madeira demi-glace, potatoes au gratin, and sauteed spinach. Call 828-239-0239 for reservations. We hope we've given you some great ideas for the week. We also hope you make the most of your time here in Asheville by extending your stay. Choose a nice downtown Asheville vacation rental and be close and conveniently located to all of the things you want to do. Are you celebrating Valentine's Day in Asheville or Western North Carolina this year? If so, tell us about it in our comment section. We'd love to hear about it! Asheville and the encompassing Western North Carolina region provide an aura of romance any time of year. From the lofty peaks to the lush valleys, the surroundings are truly spectacular. Whether you're planning a Valentines Day getaway or looking for a romantic getaway for any special occasion, this is the place for you. Nestled in the Blue Ridge Mountains and surrounded by scenic mountain majesty, this area of Western North Carolina offers a little something for everyone. No matter what your idea of romance may be, we guarantee you can find it here. Stroll the streets of downtown Asheville hand-in-hand with that special someone. Hike the trails of Chimney Rock State Park. Embark on a hot-air balloon ride. Tour the historic Biltmore Estate. Try a new restaurant. Drive the Blue Ridge Parkway. Stop in to a local nightclub and hear a new band. Take in a show. Learn the mountain curves by taking a motorcycle ride into Tennessee. Enjoy an evening at the symphony. We could go on and on, but the options are truly limitless. What's most important is that you're spending time with the one you love and doing the things you love to do. That in itself is romance. When you plan your stay here in Western North Carolina, look for the amenities that can bring more romance to your surroundings. 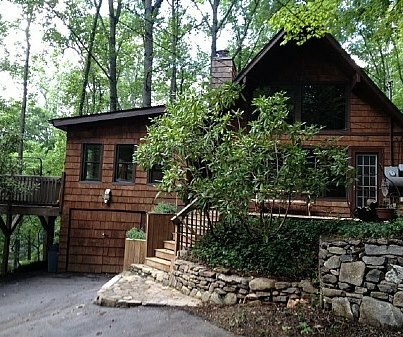 Look for a mountain cabin with breathtaking views. Enjoy the advantages of a romantic getaway that includes a hot tub. 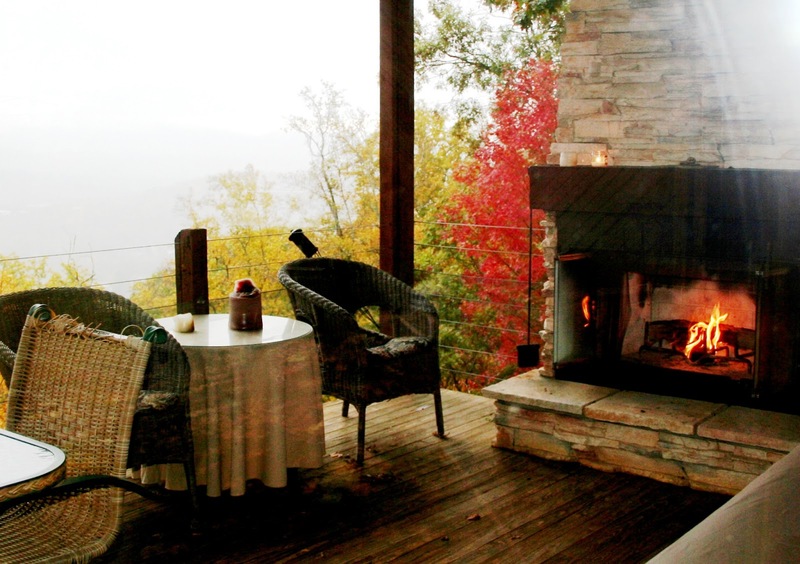 Plan for some nights of snuggling on the deck with a cozy blanket and a nice glass of wine. Warm up by the fire. We hope we've given you some great reasons to plan your romantic getaway in the Asheville and Western North Carolina area. Valentines Day is a coming soon, so start your planning now. 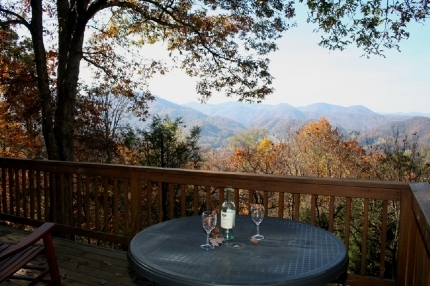 Have you spent a romantic getaway in Western North Carolina? If so, we'd love to hear about it. Tell us what you found to be most romantic!